The “Teacup Chat” series on Lavender & Twill is a short and sweet spot where we take a glimpse behind the scenes of a brand’s creative process. I am very inspired by all the talent I see building a corner in the world to showcase their work, and also making it available for others to enjoy. 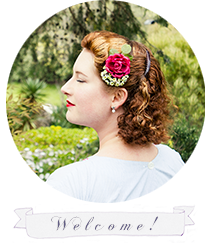 So without further ado, let’s get to know some more about the artist behind Tanith Rowan Designs! As we found out in the previous post, Tanith Rowan Designs is the work of the talented milliner, Tanith. She’s a hardworking mother of two little ones, who still finds time to pursue her dreams and creative interests. She recently released her own hat pattern, which is super cool and I can’t wait to hear more about her creative background and how she got to where she is now. Hello Tanith, welcome to Teacup Chats! We can’t wait to learn more about you. So let’s jump right in! What first drew you to creating hats, as millinery seems to be sort of a forgotten skill these days? I've always loved making things and I sort of stumbled onto hats as I was dabbling in historical costuming. I was just playing around at first, but the more I started to learn, the more I really loved the process and wanted to make more hats. The millinery world is quite active in Australia thanks to the races so I was lucky to be able to take a lot of workshops and keep learning all the time. How do you go about finding the inspiration and the patterns for your creations or do you make them up yourself? Inspiration is very easy to find! With vintage books, films, magazines and genuine vintage hats, I will never run out of ideas. I love curling up with a book and sketchbook and drawing up possibilities. I've had good training in pattern drafting so when a pattern is required for a hat I start from scratch, but a lot of hat shaping is free form or on blocks. Sometimes the fun is in the challenge of working out how to make the sketch a reality. How do you figure out techniques to create vintage styled hats ~ is it easy to replicate them by pictures and visual details? It's usually not tricky to work out how to make a hat look right for a vintage style, but some of them can be very perplexing and I'm left wondering how on Earth they've done it! I read vintage millinery books and magazines to learn more traditional techniques. The ones from the 1940s and on are easy enough to understand as the terminology and materials haven't changed a lot, but they are harder to interpret the further back you go. It’s been very interesting to find out more about your business, but we’d also love to know a little more about the creative mind behind these beautiful pieces. What is your favourite thing to do beside create your delightful hats? I love all kinds of making really. I do a bit of sewing for myself and the kids, I'm learning how to knit, and I like cooking and gardening too. And finally, what are five quirky things about you that not everyone might know about? Oh! Christmas music! I totally agree Tanith! Sometimes I just want to sing along to a carol, and some of my favourite lullabies to sing to my children are carols. I think being in a Christmas choir helped a lot with my love of all Christmas music. Thank you to Tanith for sharing her time with us, it was wonderful to have the chance to learn more about her and her inspiring creative work! And if you haven’t already, don’t forget to check out Tanith on Instagram and Etsy.